Recent studies have revealed that many, perhaps most women with hormone-responsive breast cancer have low adherence to tamoxifen adjuvant hormonal therapy. However, limited data are available on tamoxifen adherence in male breast cancer (MBC) patients. The goal of this study was to assess tamoxifen adherence and its relationship to mortality in MBC patients. 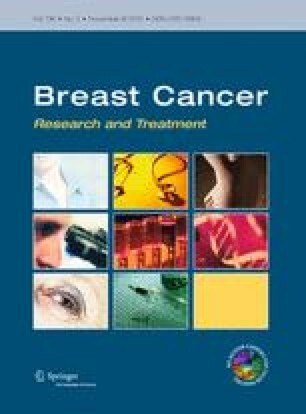 A cohort of 116 men who were diagnosed with receptor-positive breast cancer between June 1987 and July 2012 was recruited for the study using the cancer prevention and treatment system database of Heilongjiang Province. From the 116 patients who received a five-year tamoxifen prescription, only 64.6 % were still taking their medication 1 year later, and this percentage decreased to 46.4 and 28.7 % after 2 and 3 years, respectively, to 25.8 % after 4 years, and to 17.7 % in the last year. After multivariate adjustment, factors that significantly decreased tamoxifen adherence were low social support [Hazard ratio (HR) = 2.45, 95 % CI 1.32–4.55], age (HR = 1.10, 95 % CI 1.01–1.21), and adverse effects (HR = 2.19, 95 % CI 1.57–3.04). The primary endpoints in the adherence or low-adherence groups from this study were overall survival (OS) and disease-free survival (DFS) of the MBC patients. The five- and ten-year OS of the patients was 97.9 and 79.6 %, respectively, in the adherence group, and 84.7 and 50.4 %, respectively, in the low-adherence group (p = 0.008). The five- and ten-year DFS of the patients was 95.4 and 72.8 %, respectively, in the adherence group, and 72.6 and 42.3 %, respectively, in the low-adherence group (p = 0.007). The consequences of low treatment adherence in men, who have a potentially long life expectancy, may be significant. In light of these findings, there is an urgent need to acknowledge and tackle the issue of tamoxifen adherence in this patient group. We would like to thank both the men who agreed to participate in this study and their physicians for the time they devoted to medical data collection. We would also like to thank the physicians and technicians who contributed to patient selection and data extraction.